CLEVELAND, OH - December 12, 2011 - The Cleveland Cavaliers have signed guard/forward Anthony Parker to a contract, Cavaliers General Manager Chris Grant announced today. Per league and team policy, terms of the contract were not announced. Last season, the 6-foot-6, 210-pounder averaged 8.3 points on .399 shooting, including .379 from three-point range, 3.0 rebounds and 3.0 assists (the second-highest average in his career) in 29.0 minutes in 72 games (65 starts). He scored in double figures 27 times, including setting season highs in scoring (21) and rebounds (seven) while adding seven assists in 39 minutes versus Minnesota on Dec. 26 and scoring 20 points on 7-9 (.778) shooting, including 4-4 from three-point range, and grabbing seven rebounds in 29 minutes versus Miami on March 29. Parker originally signed with Cleveland on July 13, 2009. Over the past two seasons with the Cavs, he has started 146 of the 153 games he has played in and posted averages of 7.8 points on .415 shooting, including .398 shooting from three-point range, 2.9 rebounds and 2.5 assists in 28.6 minutes per game. His 2.48 assists-to-turnovers ratio ranked 14th in the league while his 0.86 steals-to-turnovers ratio ranked 13th among all players over the past two seasons (min. 150 games). 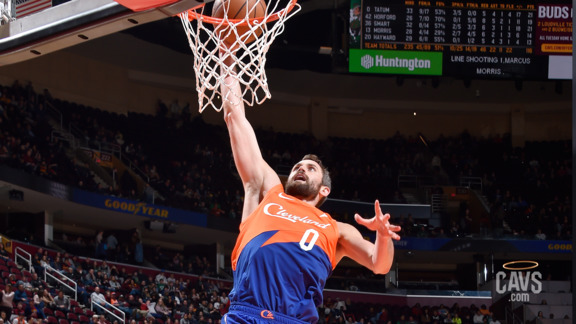 Among all active players with a minimum of 1,000 three-point attempts, the eight-year veteran ranks sixth in the NBA in three-point percentage (.409) behind only Jason Kapono, Steve Nash, teammate Daniel Gibson, Matt Bonner and Kyle Korver. Parker played five seasons with Maccabi Tel Aviv (2000-02, 2003-06) and one season with Virtus Roma (2002-03), winning five Israeli Premier League championships, five Israeli Cups and three Euroleague titles. Parker was named Euroleague MVP and first-team All-Euroleague in 2005. He averaged 12.4 points, 4.8 rebounds, 3.4 assists and 1.6 steals in 148 career Israeli Premier League games and averaged 16.3 points, 5.8 rebounds, 3.2 assists and 1.6 steals in 90 Euroleague contests.